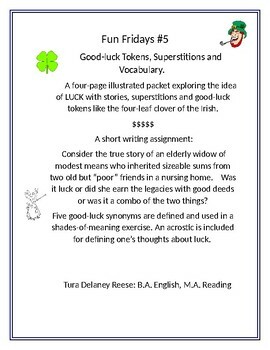 Good-luck Tokens, Superstitions and Vocabulary. 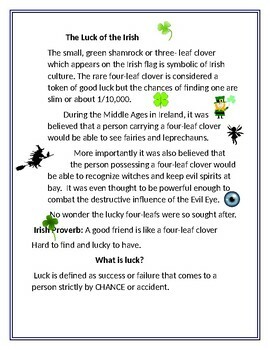 A four-page illustrated packet exploring the idea of LUCK with stories, superstitions and good-luck tokens like the four-leaf clover of the Irish. Consider the true story of an elderly widow of modest means who inherited sizeable sums from two old but “poor” friends in a nursing home. 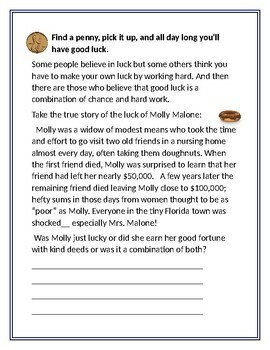 Was it luck or did she earn the legacies with good deeds or was it a combo of the two things? 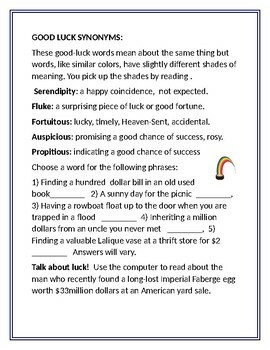 Five good-luck synonyms are defined and used in a shades-of-meaning exercise. An acrostic is included for defining one’s thoughts about luck.